Keep up with the latest 2099 news & updates...follow 2099 Bytes on Facebook! Wow....I have been lazy when it comes to updating the updates page. There have been updates since 2016. Lots. Every month since 2099 25 started. I hope you've all noticed them on the main page. Just 6 months till 2099 25! Doom 2099 issue guide is back online. Video games section is back online. Foreign reprints section is back online. Anyway. In the world of 2099 news, Secret Wars 2099 comes to a close next week on September 9th. Its been a fun enjoyable series. Certainly a must-read for 2099 fans who want to see old favorites like Strange and Hulk 2099 put in a appearance. Let's hope PAD revists the Defenders 2099 again. 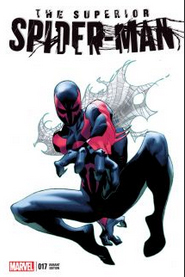 Which brings us to the news that Spider-Man 2099 returns as a monthly series on October 14, 2015. The new volume of the series kicks off with the S-Man getting a new costume. Be sure to check it out! Secret Wars 2099 #1 is out on May 27th, be sure to check it out. 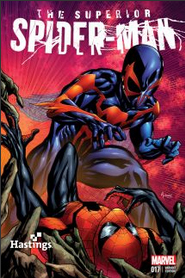 Spider-Man 2099 issue guide has been updated with issue summaries for all 12 issues of the now ended volume two. Xina and Dana added to the profiles section. Doomed Storylines section is gone for the moment. I have no problem with people downloading images from my site. That's why they are here. But if you're going to use my images on your own site....at least ask permission first...and give credit. And if you had asked me "can I download all the unpublished pages and put them on a torrent" the answer would have be been NO! The World of 2099 section has been updated with an issue guide covering all of Ravage 2099's appearances. On a whim....I scrolled down to the bottom of this page and found the first entry dates back to exactly 1/28/2005. 10 years.....woof. Although the site actually is older, that's when I started keeping track of updates. Wish I'd kept track since the beginning. Honestly I don't remember exactly when I opened the site. I've a file dating back to 2000, though most of my cover scans are dated 2002. In any case...its nice to know that the site has survived at least 10 years. Here's to 10 more! Finally completed the re-haul of the Marvel Knight 2099 section. A link has been added to the Doom 2099 issue guide. I may add a link on the "World of 2099" page. With "Avenge the Earth" wrapped, I have added Doom 2099's appearances in Uncanny Avengers to his issue guide. With the events of Spider-Man 2099 [v2] #5 behind us, I've updated various entries to reflect how different Miguel's have died (Marvel Knights, Avengers Forever, & Exiles Miguel). If you have been following my facebook page (hint hint click above and LIKE! ), you will know that The Doomed Storylines has been updated. New additions include: two pages from an unpublished Punisher 2099 story with art by Tom Rasch. A proposal for an unproduced series which would have seen a 2099 version of the Night Raven. And also a correction as I've know learned who was really behind that Captain America 2099 page that was recently up for auction. Doom 2099 has returned to comics! Check out recent issues of Uncanny Avengers (relevant issues for us Doom 2099 fans so far are: #14, 18, 19, and 20). For now all appearances have been brief. If something significant happens, I will post an update. Otherwise, I am waiting until the story arc is over before I summarize and review. Also made a small addition to the Doom 2099 issue guide. I had previously omitted Doom's brief cameo in Ravage 2099 #7. Another addition to the Doomed Storylines section. I have finally uploaded a scan of page 14 from "Credit Crunch", which I purchased some time back. Enjoy! Remember to follow my facebook page. There is some 2099 art posted there which I haven't posted on the site. Mostly convention sketches which as of yet don't have a place here on the site. Also I will post any sightings of 2099 characters there too. Keep your eyes peeled. If you've read the recent Superior Spider-Man issues with Miguel, then you know that he will be around for some time. Also there is a Doom 2099 appearance in the not so distant future. The Doomed Storylines section has been updated with a high-res scan of the colored cover to Art Nichol's unpublished Doom 2099 story. Happy to say that the color guide for the cover is now part of my collection. I cleaned it up, just as I did with the Radian story, so that it looks closer to how it would have had it been published. The World of 2099 section also got a face lift. Feel free to let me know what you think. The goal is to make all those links work some day. I'll be adding adding some other unpublished art soon. If you want to keep with the updates to the site, and you're on Facebook, be sure to like my new fanpage for 2099: 2099 Bytes. Last but not least, 2/3 of Spider-Man 2099's comeback is out. The final part, Superior Spider-Man #19 will be out October 16th. If you're on Facebook, head on over to 2099 Bytes and let me know what you think so far of the story! It's Friday the 13th....and if that isn't ominous enough...I've decided to create a new facebook page: 2099 Bytes. Like and share! Remember also, Superior Spider-Man # 18 is out next week! Spider-Man 2099 has returned! Superior Spider-Man #17 is in stores now! You can also download digitally. Marvel has released the issue with a number of variants by Oliver Copiel, JG Jones, and 2099 vet Mike McKone (Spider-Man 2099 and 2099 Manifest Destiny). Mike's variant is a homage to the classic cover from Amazing Spider-Man #371. Added Spider-Man 2099's brief appearance in Age of Ultron to his Misc. appearances. Getting ready for the real deal in Superior Spider-Man #17. Will need to wait and see how / if this will fit into the existing Issue Guide. Another creator update. If you liked their work on 2099, then give their current projects a try. In future I want to open a dedicated page for this info. Gene DeCicco (2099 Unlimited) will be doing finishes on The Rockthrower, a 5 issue limited series by New Paradigm Studios. You can read a preview here. DC Nation Doom Patrol shorts written by Tom Peyer (X-Nation 2099, Doom 2099) start this weekend. You can watch a clip here. If you haven't already, check out Joe St. Pierre's (Spider-Man 2099) creator-owned web comic, The Liberaider. So its been months since the last update. I have a very good reason....but I am not telling you. At least not until 2017.....and that's all I am saying for now. After months of teasing....Spider-Man 2099 is back. Marvel's September solicits reveal Miguel O' Hara will to the comic pages beginning in Superior Spider-Man #17 and will continue to appear in #18 and #19. Beyond that, we will need to wait and see. Variant covers by Oliver Copiel and J.G. Jones are to be released for #17. To coincide with his comeback, Marvel is reprinting Spider-Man 2099 Volume 1, the TPB which was released back in 2009 for Timestorm. This time they are following up with a second volume that will collect Spider-Man 2099 #11-14, the Evan Skolnick scripted S-man stories from 2099 Unlimited #1 - 3, and the Spider-Man 2099 Annual. On the heels of a small panel appearance in Age of Ultron #10, it seems that Doom 2099 is also coming back. Writer Rick Remender has said that Doom 2099 will play a "big role" in future issues of Uncanny Avengers. This month I thought I'd highlight what some 2099 creators are up to these days. If you liked their work on 2099, chances are you might want to see what they're up to now. Since Mach of last year, Steve Pugh (Doom 2099) has been the regular penciller on DC's Animal Man. You can follow its release schedule here. Animal Man is also edited by former 2099 editor Joey Cavalieri (everything 2099). Warren Ellis (Doom 2099, 2099 Apocalypse, 2099 Genesis) has a new fiction novel out in bookstore now, Gun Machine. Max Douglas' (2099 Unlimited, Ravage 2099, Ghost Rider 2099) new project, Dracula: Son of the Dragon, has a Kickstarter if you would like to contribute. Bob Larkin (2099 posters) has a new sketchbook out from Fantom Press. All proceeds go directly to Bob and Fran Larkin. Rick Leonardi (Spider-Man 2099) has a been pencilling a new series, a modern update of Sherlock Holmes called Watson and Holmes. You can learn more on their facebook. Its available for purchase here. 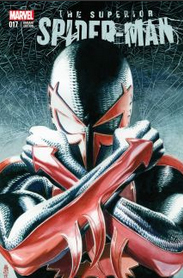 Peter David (Spider-Man 2099) also currently writes Marvel's X-Factor. You can follow the release schedule here. Remember that Peter suffered a stroke on December 29, 2012. Learn how you can help with his recovery here. Last but not least, I've updated the Foreign Reprints section with info about UK reprints and as a special bonus, some comments from Onofrio Catacchio, one of the artists who provided original covers to Italian reprints of 2099. First update of the new year! Quite of a bit of news related stuff I need to catch up on. First, Peter David, writer of Spider-Man 2099 (among many many many other things ) suffered a stroke on December 29, 2012. Learn how you can help with his recovery here. I recently purchased a copy of "Darkness Of The Light (The Hidden Earth Chronicles)." Doom 2099 artist Pat Broderick has debuted a new web-comic, Nibiru and the Legend of the Annunaki . The art is great, just what you would expect from Pat. I've subscribed, myself, just $18. I think he may be moving the comic to a different site, so if you're interested, check out his Facebook for the latest. While tweets prior to the debut Superior Spider-Man #1's release teasing that Miguel O' Hara was the new Spider-Man were just a prank, Dan Slott has gone on record stating that Miguel O' Hara will appear in Superior Spider-Man. How, when, which....that all remains to be seen. You will recall that it was stated that Spider-Man 2099 would appear in some form back in last years NYCC. Dan Slott wrote for 2099 during its original run, he introduced the Midsummer Knights in the pages of 2099 Unlimited. He also wrote a Spider-Man 2099 story which unfortunately went unpublished. He also wrote for the Spider-Man Shattered Dimensions video-game which featured Spider-Man 2099. Clearly he's a fan. So keep your eyes peeled on Superior Spider-Man. The April 2013 solicits may have even given us a clue that we might see Miguel pretty soon. The solicit for Superior Spider-Man #7 states that there will be " a new development for a Spider-Man who hasn’t been seen for some time. And by time, we mean centuries." Interpret that as you will. I'm reopening the "Concept Art" section. Its mostly stuff you have all seen because it was published in the comics. However I got my hands on some character designs from some Fall of the Hammer characters. Check it out. The Doomed Storylines has also been updated with some pages I bought from the unpublished Public Enemy story. Check it out. It just came to my attention today that I still had pages linking to images hosted on geocities. Whatever server these files are on appears to have been compromised and is sending out Malware. Or at least that is what Google Chrome tells me whenever I tried to open my own page this morning. Anyway, I have done my best to remove all links to geocities. But if you see a page which is being flagged for Malware, please let me know! . The Doomed Storylines section has been updated with lots of information about unpublished stories featuring Spider-Man 2099 and also one with the Driver (the comic character, not the fan). A clearer picture of what didn't make it to print continues to form! A huge thanks to The Driver (the fan, not the comic character) for providing me with these details! Additionally I've added two more pages to the Hooligan 2099 story which I've had for awhile, but never posted. I know...shame on me. I've been holding out on you all! My thanks also to artist Gino De Cicco for kindly identifying the writers of this story. In other unpublished news, Max Douglas has posted the rest of his unpublished Ghost Rider 2099 story, Horrorshow. Check it out. NYCC has yielded hope for an appearance by Spider-Man 2099 sometime in the future. Something is coming....what....when....by who.....we need to wait and see. You may also have noticed that Dan Slott is trying to convince people that Miguel O' Hara is the new Superior Spider-Man.....of course it's a red-herring. But if you'd like to discuss, visit the 2099 UG Board. The Articles / Promos section has been updated with a poster featuring Punisher 2099. Also uploaded some cover scans of magazines with 2099 related interviews. Max Douglas has posted his unpublished Ravage 2099 story. Check it out, it looks amazing! Consequently, I've also added it to the Doomed Storylines section. Amazon.com is taking pre-orders for Doom 2099: The Complete Collection by Warren Ellis due out in April 2013. This represents the first time ever that Doom 2099 as a series has been collected in TPB form. This month's update comes early! A small, but significant update to the Games section. Added a link to a short clip of Punisher 2099 from the canceled Marvel 2099 videogame. The clip is very short and very low quality, but definitely worth watching. The Driver found this clip years ago. Thanks Driver! Site visitor Don has posted images of his custom Doom 2099 statue. It is a beauty and is a truly must-see. A link has been added to the Links section. Be sure to also check out his original comic art as he owns various pieces of Doom 2099 artwork as well. The Foreign Reprints section has been updated with info all about 2099 reprinted in Finland. My thanks to 2099 UGR board member Travesty for providing me with all the info and images. Thanks Travesty! First off, I added a write up for Timestorm 2009 - 2099 to both Doom and Spider-Man 2099's Issue Guides. Updated the Foreign Reprints section with some images and information about issues reprinted in Italy, Brazil, and Spain. A few months back I purchased an unused Spider-Man 2099 cover from Joe St. Pierre. It was for the Vlad the Impaler story for which he did the artwork. The story was originally meant for the main title as an inventory issue but eventually was published in 2099 Unlimited #9. The cover however went unused. I've added an image of the cover to its entry in the issue guide. Check it out! Whenever I can get my hands on a large format scanner, I'll repost a higher-res version. Jason, a contributor over at Comic Art Fans.com, has posted a color version of the cover to Art Nichols' unpublished Doom 2099 story. This gives us a fantastic view of what this issue might have looked like had it been published. Additionally, the fact that the cover was colored is (I hope) a sign that we might one day see lettered pages of this story turn up. Perhaps one day we might finally find out what exactly this story was all about, what it was called, and who wrote it. Jason's also posted an alternate cover to Doom 2099 #26. Its a real beauty, so be sure to check it out. Updated the Spider-Man 2099 Issue Guide with his appearances in the Exiles. Added Doom's appearance in Ravage 2099 #33 to the Doom 2099 issue guide. Just a very small update to the Articles / Promos / Merchandise section. Added images of two Spider-Man 2099 posters. Updated the Misc. appearances of the Sman guide with info about his UK appearance. Added links to a bunch of unpublished 2099 story artwork. Real good stuff. Opened a section on Video Games to cover 2099 as it has been portrayed in games. Added new scans of magazine articles related to 2099, including those from 3D Design covering the aborted game. Happy new year everyone! To ring in the new year, I've decided to open up the long gestating "World of 2099" section of the site. For some time I've planned to expand the site to cover all 2099 comics. This year marks the first step towards that goal. I've had this site just about Doom 2099 for well....years....so it will probably be many many many more years before I can cover everything. Anyway, check out the new section. The first 2099 hero to get his own sub-site is arguably the most popular, Spider-Man 2099. I'm open to suggestions on who to tackle next. Remember the sub-site is not complete yet. So more update will be forthcoming. Soon you're going to start seeing webs around here. Created a new section for the site to cover how 2099 comics were reprinted outside the US. Check it out here. Ok, so its been just short of a whole year since I last updated the website. But what an update! I was recently fortunate enough to purchase a series of "color guides" to pages from an unpublished story starring Radian! It features Radian post-Doom 2099 #18 confirming, as was hinted, that he did in fact survive. The story was written by Terry Kavanagh with art by Alcatana (artist on Doom 2099 #13). The color guides consisted of one black and white page with dialogue balloons and one color page minus dialogue balloons. Both pages would be marked with color IDs. I went ahead and did my best to remove the color guide notes and then combine the pages to create a reasonable approximation of what the story would have looked had it been published (see below). For all the pages, head over to the long gestating "Doomed Storylines" section. I had always envisioned that page to just list some loose ends from the comic. Never in a million years would I imagine that I could post actual pages from an unpublished story. Long time Doom 2099 fans will remember that before my site existed there was another Doctor Doom / Doom 2099 page called Doomscribe's Den of Madness. Years ago Doomscribe also found pages from a unpublished story which actually featured Doom 2099. He now has them hosted on his Photobucket page. So if you haven't seen the pages before, check them out! The story Doomscribe found features art by Arthur 'Art' Nichols and finds Doom going on a Wizard of Oz inspired adventure. Finally, while we are on the topic of unpublished 2099 stories, Punisher/Punisher 2099 scribe Chuck Dixon has posted pages to yet another unpublished Alcatena story starring Punisher 2099. You can check it out on his blog/webpage. 7-13-11 Update to the Update: Site visitor Timo reminded me that Mark Waid's proposal for a Daredevil 2099 proposal is online. Check it out. Thanks Timo! Last weekend I had the great pleasure to meet Doom 2099 artist Pat Broderick at FL Super-Con. He spoke on two panels, one on DC and one on Marvel. I passed by his table and managed to talk a bit about 2099. Throughout the conversation it was clear that even after all these years he still thinks highly of the series. He spoke of how every artist wants to have a long run on a title, something to call their definitive run. He hoped that Doom 2099 would be his. This was one of the reasons why he stuck with the title after John Francis Moore left. By their second year, he felt that the title had gained a certain momentum. Of course we all know that when Warren Ellis took over writing chores creative differences over the direction of the book (particularly the killing off of the original supporting cast) culminated with Pat being taken off the book. I asked him if had any original pages from Doom 2099, which to my surprise he said he had nothing left. I finally brought up that Marvel had tried to bring back 2099 a couple of times (Marvel Knights 2099, Timestorm 2099). He had apparently not heard of this and actually started asking me questions about these new 2099 books. He was particularly interested to know who they brought back. I of course told him about Spider-Man, Punisher, Ghost Rider and Cerebra. Of course I mentioned that Doom was there, but not in his Doom 2099 armor. The 2099 armor only shows up in one panel. He was, of course, disappointed. Activision is releasing a new Spider-Man game. Not something that I would normally mention here except that Spider-Man Shattered Dimensions features 4 different versions of Spider-Man. At this week's E3 it was revealed (not a surprisingly) that one of those dimensions would be Spider-Man 2099. I doubt that Doom 2099 will play any role in the game, a cameo in the background at best, but this is nonetheless good news for 2099 fans. Fans will remember that plans existed for a 2099 game back when the comics were still in print but scrapped when Marvel went bankrupt and all 2099 titles were cancelled. 2099 has appeared a few times over the years as alternate costumes in Spider-Man games (Ghost Rider 2099 was also in the Ghost Rider movie game I hear) but this will be the first time that a game will be set in the 2099 universe and allow players to take control of Miguel O' Hara. Added profiles for the Phalanx and Paloma. Decided to not do profiles for Radian, Y'Lestja, Hulk and a few others....at least not now. Maybe in the future. For now I think I have covered all the major players of the series. Check out the Promos section for images from the 2099 launch poster. It features really fantastic art by Doom 2099 artist Pat Broderick. at least as early as 2002, probably 2000 (I had a site on NBCI, but not even I recall the URL, used to be part of a larger site, Comics Etc. ) and I got nothing to show for it. I didn't make the same mistake with DoomGate. But well, I'm going to try and change that now by maintaining a record of my updates from here on in. Appropriate since this marks the beginning of a new phase in the site's history. Since Geocities is closing, my home since 2002, I finally have my own domain now, doom2099.com . Hopefully this one will be here to stay. I've pretty much completed all the moving from one site to the other. The old site will still be active until 10/26/09 so says the Geocities page. If anything is not working here on the new site, just let me now. With TimeStorm 2009-2099 over, expect a write up sometime in the future. Already made space for it on the Issue Guide. Hopefully I will get around to finishing the Profiles page too. That way I can finally move onto my next project....The World of 2099. You can probably guess what it will be, but I don't want to say it until I know I am going to do it. Speaking of Timestorm, the TPB is due to release on November 4, 2009. Marvel Catalog page. Also TPBs are out now of "classic" 2099 material from Spider-Man 2099 and X-Men 2099 Support these trades so we can get more! over at the 2099 MUGEN game. Check it out! History of Latveria slightly revised. First update of the New Year, and this certainly looks like an exciting one. The big news now is this weeks release of Exiles #75: World Tour 2099 part 1. From the previews and covers found on several sites, we can expect a lot guest stars. Let's hope the Exiles make their way over to Latveria a certain armored monarch. Anyway, for now here is just an image of the cover ripped [courtesy] of Marvel.com. - The Fantastic Four's origins is never addressed, indeed their very presence is ignored save for being listed among the significant inhabitants. - Gabe O'Hara is evidentially not the Green Goblin as it is not listed as an alias. - Latveria is apparently NOT a significant location; however Attilan, Las Vegas, and Xavier City are?! - Spider-man meets Spider-man 2099 is in continuity, so are Time Flies [the Captain Marvel arc] and Halloween Jack's appearance in X-Force. Curious is a mention of the X-Men 2099 fighting the regular X-Men of 616. I don't know what issue this takes place and the bibliography makes no note. Feel free to enlighten me. - Doom's reason for invading America was apparently because of his dissatisfaction "with his accomplishments thus far." I guess it would have been too much for them to ask someone who actually READ the comics to pitch in? Someone whose run a website about the character for over 5 YEARS! Never mind, moving on. - Thankfully they repaired the both criminal and illogical retcon from Manifest Destiny stating that Doom had released the fake Captain America, who incidentally is definitely not the real one by virtue of Manifest Destiny being canon. - Apparently "Doom's vengeance was swift." Yeah, that's one way to say it. -Much is made of 616's Doom saying that he will not allow the 2099 future to come to pass. - Like the Fantastic Four, no mention is made of the X-Nation kids or the mutant messiah plot. Nostromo is the only X-Nation character that is named. - No non-title characters i.e. Galahad, Metalscream, etc, are mentioned. - The controversy over the Hulk's death is not addressed. No 2099 character gets an individual entry however neither do characters from other universes save for a few justified exceptions. 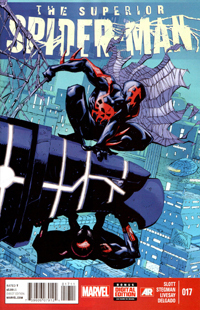 The image used is the Greg and Tim Hildebrant cover image from the 2099: World of Doom Special. All in all it is touch and go. The entry is mostly Spider-Man and Doom centric, the latter being good for me, however everyone else gets short-changed to a simple one sentence mention and some not at all. For the page and a 1/2 that it has, it manages to compress a lot of info, however it hardly does it justice. Seeing how something as ambiguous as the Age of Apocalypse gets it's own handbook, I personally feel that an imprint like 2099 which comprised over 100 issues spanning a handful of years deserves something better. The same can be said of the New Universe whose entry has an oddly larger font. Although slightly older news, it is nonetheless news that the Exiles World Tour has begun. Interested parties may want to pick up issue 69 even though the visit to 2099 is some time off. The issue is a good start off point for those unfamaliar with the book, like me. The last page features a preview of the 2099 cover image. The cover features just about everyone from Spider-Man to Punisher, and Metalscream to an oddly incongruous SHIELD foot solider. Doom, who I imagine is in his pre-#25 armor is annoyingly covered by the Next Issue box. You should be able to find this issue on the racks and can look forward to the next issue soon. For right now the Exiles are in the House of M Earth - 616. Lots of 2099 stuff to rave about. First, Newsarama has revealed details about the upcoming Official Handbook of the Marvel Universe: Alternate Universes 2005. It will of course feature an entry for 2099. Look for it in stores on 9/28/05. Also from Newsarama, details have surfaced about the upcoming Exiles World Tour. The reality hopping mutants will find their way into the 2099 universe in issues 75 and 76. In other news, I forgot to mention but my satellite site, Doomgate has officially opened. Go ahead and check it out. Finally, I've also updated the issue guide with a write up for X-Men 2099 #28 which features a literally small Doom appearance. Also Nostromo's key appearances now reflects his appearance in X-Men 2099 #34. Not really Doom related, but I finally have every issue of X-Men 2099. And I wasn't even trying either. I've visited the local comic book shop and picked up the latest Knights 4 and FF issue. Both feature Doom but neither in any particularly big way. I'm afraid I can't recommend. appearances instead of bundling them with the 2099 Under Doom stuff. I wrote a review of the MK2099 Black Panther back when it first came out. I forgot that I hadn't put a link for it so it has been sitting on the server gathering dust. I only reviewed Black Panther because it has a new MK Doom 2099. Also, look for some changes in the Issue Guide. I'm adding a few odd and ends and possibly moving a few things around. First update of the new year. Nothing major. I've only made some routine maintenance on the site. A few dead links here and a few missing pics there. I have however finally opened the Enemies section. Whew..that's taken awhile. It's still not complete though.